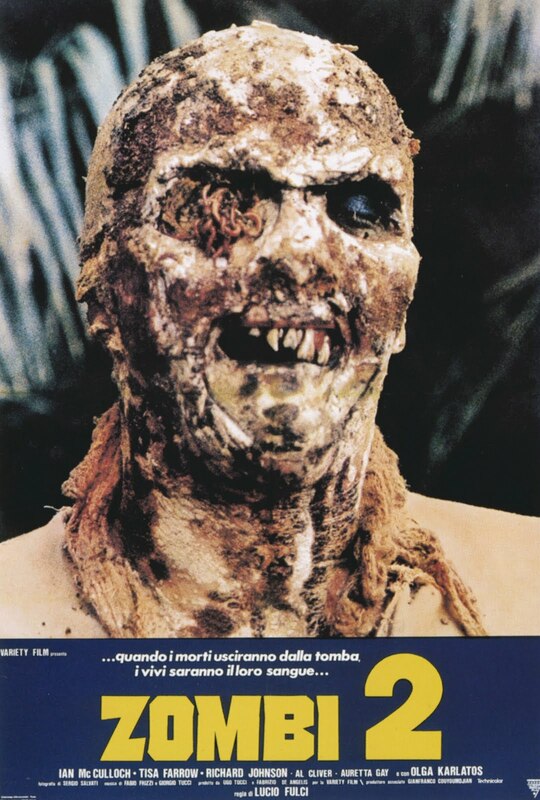 Released in 1979 by infamous Italian horror director Lucio Fulci, Zombi 2 sought to profit from the international success of George A. Romero’s film Dawn of the Dead (1978)—which was re-cut by Giallo maestro Dario Argento and re-released in Italy under the title “ZOMBI” just one year earlier. This unofficial sequel goes in quite a different direction than the Romero film, forgetting the playful humor and veiled social-commentary found throughout Dawn of the Dead. Instead, Zombi 2 brushes all those cinematic dressings to the floor, opting to offer a fistful of blood and guts to the horror-hungry audiences who gather to partake in this gore–filled feast. Taking place mostly on the tropical island of Matul, islanders fend off waves of rotting undead who’ve been resurrected by mysterious voodoo-like means. The film is best known for sequences such as a splintered piece of wood punctures directly into one screaming woman’s eyeball, and a lengthy underwater wrestling-match between a ravenous zombie and a (real-life, god-honest, living) shark! 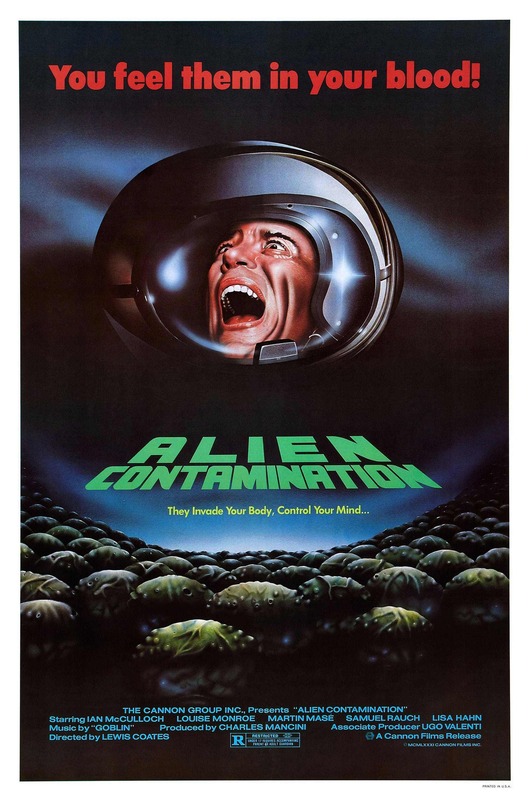 Contamination, (which was unsurprisingly also released under the title Contamination: Alien on Earth) came in the wake of Ridley Scott’s cinematic masterpiece Alien. In this case, however, the cosmic critters have landed on Earth and are going about their destruction of unlucky human victims in much campier ways. The film begins as a group of policemen explore an eerie derelict freighter that has floated into New York harbor. The tension grows as the men scour the darkened empty corridors, and then… they stumble across a pod of gooey pulsating eggs reminiscent of the ones from Alien. Just when the audience has taken its first disappointed sigh, the eggs erupt and drench the men in green-goo, which, in turn, causes their chest cavities to violently explode in a mixture of blood and discarded beef innards that the FX artist had purported picked up last-minute on his way to the set. The rest of the film plays out like James Bond on acid, with a synth driven score by renowned Italian horror score band, Goblin. Following the booming success of Steven Spielberg’s Jaws, filmmakers everywhere were rushing to join in on the “monster from the deep” craze that was selling tickets like hotcakes from drive-in booths. The Italians always did it best, and in 1981, they gave us Great White, a movie about a gargantuan man-eating shark that terrorizes a seaside community. 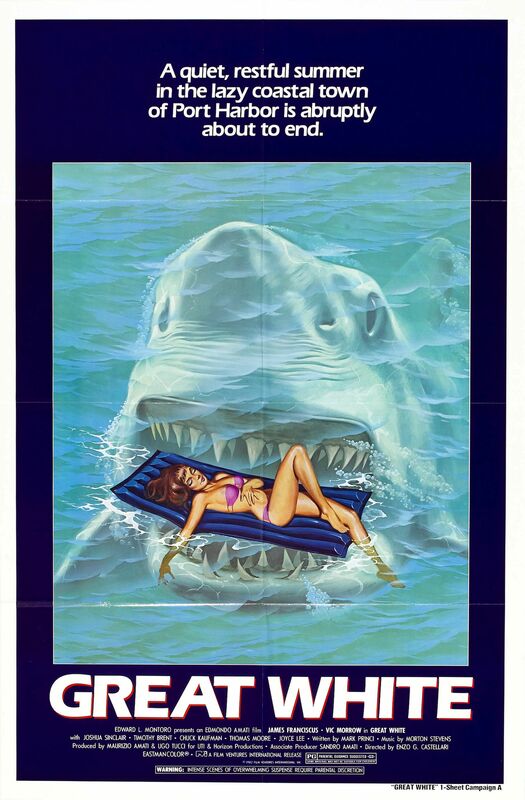 The similarities between this film and Jaws are countless, including an idiot governor who insists on keeping the beaches open and a mustached Vic Morrow doing his best Sam Quint impression. Like Jaws, Great White offers late-night moviegoers many memorable scenes—usually involving a large animatronic shark head that bites off limbs. Unlike Bruce (the shark from Jaws), the beast in Great White bellows comical roaring sounds every time its lopsided head pokes out of the sound-stage pool. As per-usual, the Italian filmmakers go to new extremes, giving us a scene in which the shark pilots itself up out of the water like a torpedo, biting down onto a helicopter flying overhead, and dragging the whole mess of screeching metal and flailing limbs back into the water. Due to it’s many blatant marketing and plot-related “homages” to Jaws, Universal Studios issued a lawsuit that would result in the film being barred from release in North America. When The Evil Dead was released in Italy, the Italian distributors retitled it “La Casa” (“The House”). 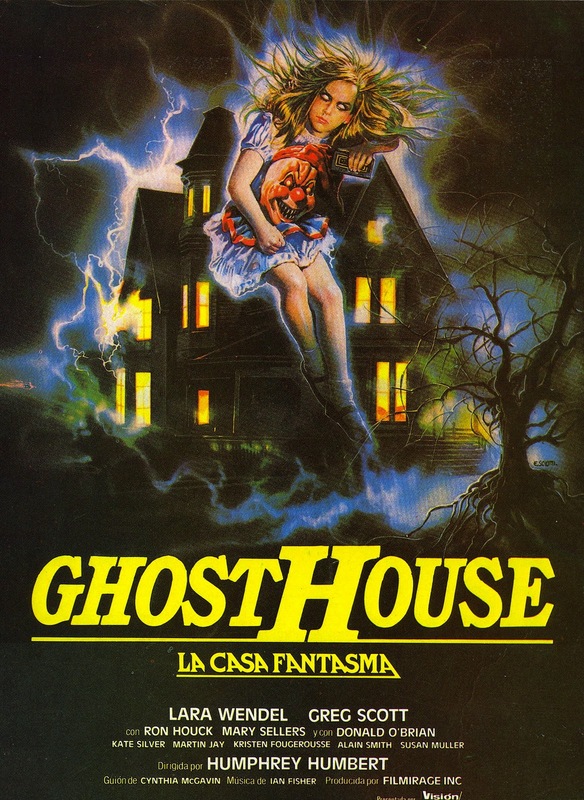 Following the success of The Evil Dead and Evil Dead II, the marketing geniuses behind Ghosthouse released their film in Italy under the title La Casa 3. Ghosthouse is a movie that cannot be summarized, because there is no coherent plot. Characters stumble upon a spooky abandoned house and bizarre shenanigans ensue. One woman falls into a pit of white goo, a chanting clown doll flies around dimly-lit rooms, disembodied hands sink hatchets into bumbling victims’ heads, and best of all, a cross-eyed old man with a pitchfork (whose presence at the “Ghosthouse” is never explained) chases teens around cemeteries in endless fits of rage. Ghosthouse tries to cash in on the success of films like Poltergeist and The Amityville Horror (1979). But unlike those films, which establish a sense of legitimate dread through careful exposition and nicely crafted scenes of terror, Ghosthouse plays out like a Halloween-time afterschool special. Only here, many scenes of cheesy gore have been added to traumatize—or, as was in my case, thoroughly entertain—the unsupervised children who have gathered around the varnished-wood television set to watch it. Tags: Tyler Macri. Bookmark the permalink.